Клещи дългоусти закривени к-т 3бр - ZT-01141, SMANN TOOLS. 3PC PISTOL PLIER SET - ZT-01141, SMANN TOOLS. 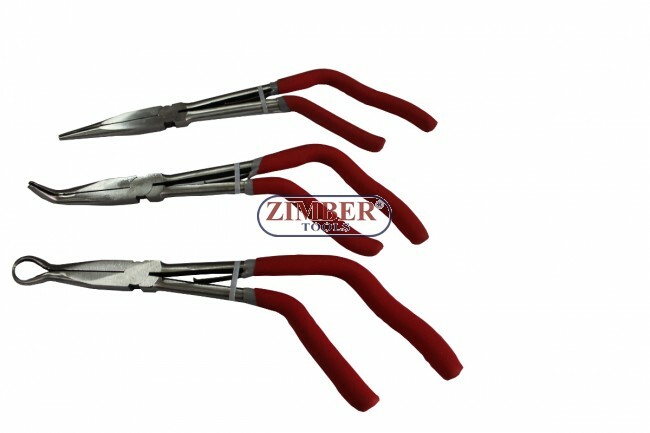 3 piece offset handle long reach pliers set is easier to reach difficult and tight places. Offset handle provides more leverage and pulling power. Constructed of drop-forged, heat treated, fully polished chrome vanadium steel. Comfortable double padded cushion grip. 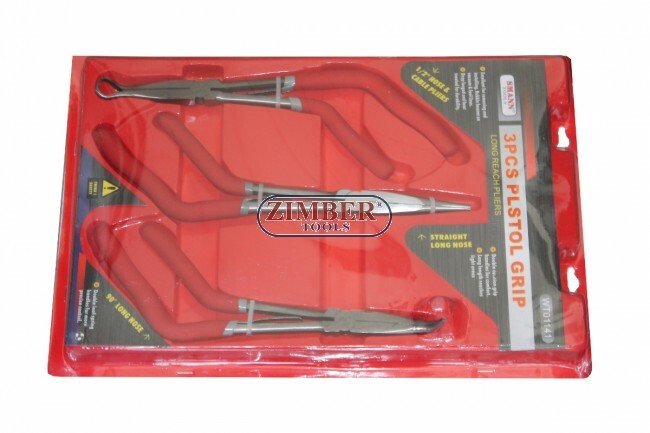 Клещи дългоусти криви 90°, 280mm ZR-19LHBNP1190 - ZIMBER-TOOLS.LS. Клещи дългоусти прави 280mm - ZIMBER-TOOLS. Клещи дългоусти прави 280mm ZR-19NP - ZIMBER-TOOLS. Клещи дългоусти криви 90°, 280mm, ZR-19PLNNB1101 - ZIMBER-TOOLS. Клещи дългоусти за свещи 280mm, ZR-19PLSP11 - ZIMBER-TOOLS.